The most aggressive branch of the martial forces of the Cult do not need stimms or mind control to do our work. 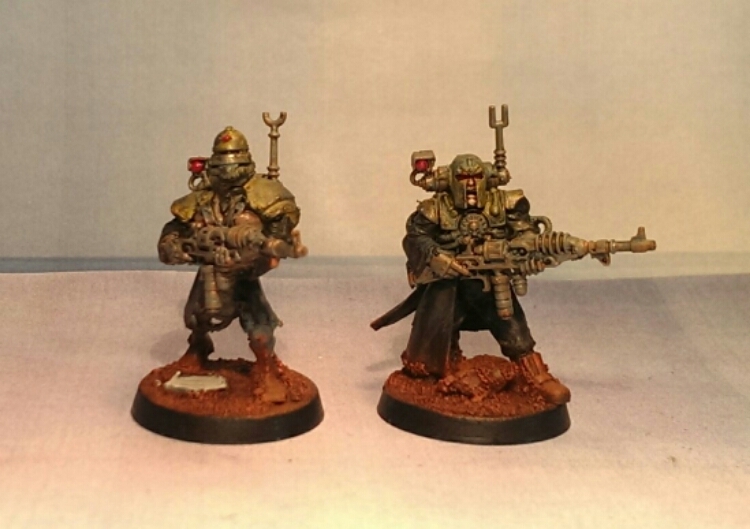 Their fate in the true cause is enough..
Another couple of warriors ready for the Cult! This is my Skitarii Alpha Prime’s personal bodyguard – a devout collection of warriors. More on the Prime soon. Awesome work, Bigboss! Been following the progress of your Dark Mechanicus with interest. Can’t wait to see more. Cheers mate 🙂 stay tuned for more cause I’m dealing with my backlog of unpainted darkmech as we speak. Love it – you’ve been posting quicker than I’ve been able to comment though – slow down, you’re putting the rest of the blogverse to shame!